William Warden Renny was described as one of the oldest and most honourable of Dundee's merchants. He lived a life steeped in the knowledge, workings and trading of flax, both here in Scotland and also in Russia. 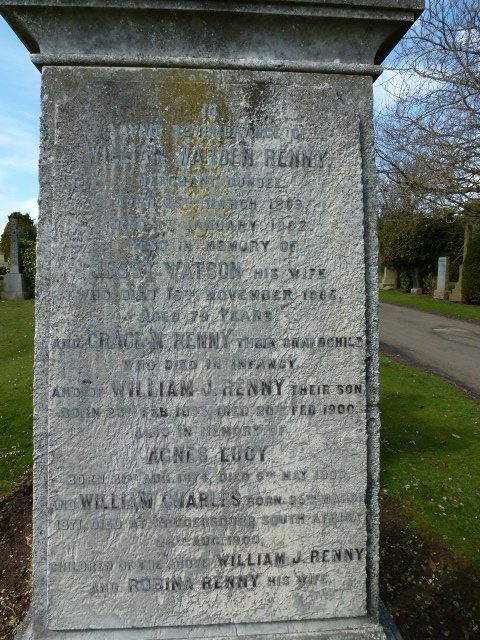 Born into a well known Arbroath family, William Warden Renny began his working life training as a 'practical spinner.' The Renny family were the pioneers of flax spinning by machinery in Arbroath (firstly as Fitchet & Son, then as Renny, Sons & Co). As a young man, he went to Archangel to represent a house in the flax trade. He gained a wide reputation in Russia as being an authority on the workings and trading of flax. At the time of his marriage in 1837, he was described as being a merchant in Archangel. It was not until 1850 that William Warden Renny first appeared in the Dundee Directory, living and working in the town and representing 'Hill & Renny,' flax merchants (from 1850 in King Street, from 1853 in Panmure Street and from 1856 in Meadowside). 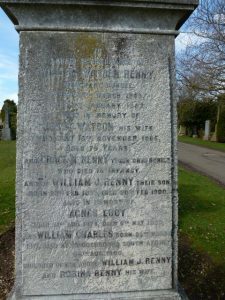 William Warden Renny’s background supported an awareness of the flax industry in Angus from the outset. Three years before his birth in 1809, his father and his uncle, as partners of William Fitchet & Sons, built the Bell Mill (later to be known as the Brothock Mill. Pioneers of flax spinning by machinery, the mill’s Boulton & Watt engine was later accompanied by another one built by Carmichael of Dundee. William W Renny was destined to be trained, in his youth, as a practical spinner. William Warden Renny became an authority on flax, having also, as a young man, spent a period at Archangel, where he was engaged in the trade. Such was his thorough knowledge of the flax trade there, that he was credited with content to Chapter V111 on ‘Russian Linen’ within ‘The Linen Trade, Ancient and Modern’ by A J Warden. He was not the only member of his family to have connections with Archangel. His younger brother Charles represented the firm of Hill & Todd in Archangel and was also the British Consul there. William’s sister, Agnes Johnston Renny, married Dr John Mackenzie (surgeon in Archangel) in Archangel. However, their fate was sealed in 1860, with the disappearance of the steamship ‘Edinburgh,’ on voyage from Leith to St Petersburg. Their lives and those of their two young daughters were lost. William Warden Renny was said to have been a friend and valued correspondent of John Todd of London, flax merchant. 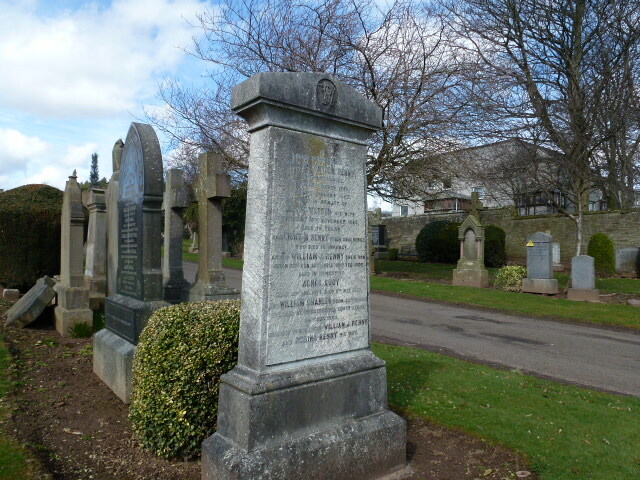 Todd was reputed to have been one of the largest flax merchants in the world and, for many years, did business with Dundee, being represented by ‘Hill & Renny.’ His son, Charles Edward Todd became William W Renny’s partner within ‘Hill & Renny’ in Dundee. After William’s death in 1882, Charles Edward Todd continued in partnership with William’s nephew, Henry Renny (son of his brother Charles). As well as operating the business of Hill & Renny, William was also the co-owner of the brig Nadejda. This substantially built brig was launched from the shipbuilding yard of Mr John Brown in 1858. She was to be commanded by Captain Inglis, the other co-owner. The voyages of the Nadejda appear frequently in the arrivals from the Baltic, with its cargoes of flax, tow and codilla. One eclectic cargo from Archangel in 1858 included – 6 pairs women’s slippers, 30 wooden bowls, 3 wooden kits, 11 wooden tubs, 5 wooden baking dishes, 1 bone box, 24 kits manna croup (husked grains of manna grass used in Russia as a kind of semolina) and 63 dozen tongues – Hill & Renny. 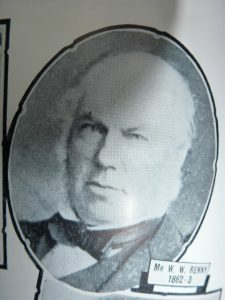 William Warden Renny enjoyed a long and successful career as a flax merchant. Known as a peace-maker, he was frequently sought as an arbiter in disputes where his opinions and decisions carried weight. His name was as familiar in the flax trade throughout Russia as it was at home on the streets of Dundee. Warden, Alex. J. (1864). The Linen Trade - Ancient and Modern. p.339. London. Longman & Co. The information above about William Warden Renny has been collated from a range of digital and hard copy sources. To the best of our knowledge it is correct but if you are relying on any information from our website for the purpose of your own research we would advise you to follow up the sources to your own satisfaction. If you are aware of an inaccuracy in our text please do not hesitate to notify us through our Contact page.